The recipe for these delicious oatmeal pancakes comes from a great friend of mine, Sharon Waldner. (I’m not sure who the credit goes to for the original recipe but they are too good not to share!) On top of being one amazing cook, Sharon is gifted in hospitality…. its always a delight to be in their home! Thanks Sharon for sharing this recipe with me! One of the reasons I love this recipe is that the pancake batter soaks overnight. I feel accomplished when I get up in the morning knowing what I’m making for breakfast and having pancake batter ready and waiting is so slick! Mix all ingredients. Cover and refrigerate overnight. In morning, whip 6 eggs until smooth. Fold into pancake batter. Heat griddle to 315 degrees – spoon batter onto buttered skillet. When nicely browned, flip and cook until finished. 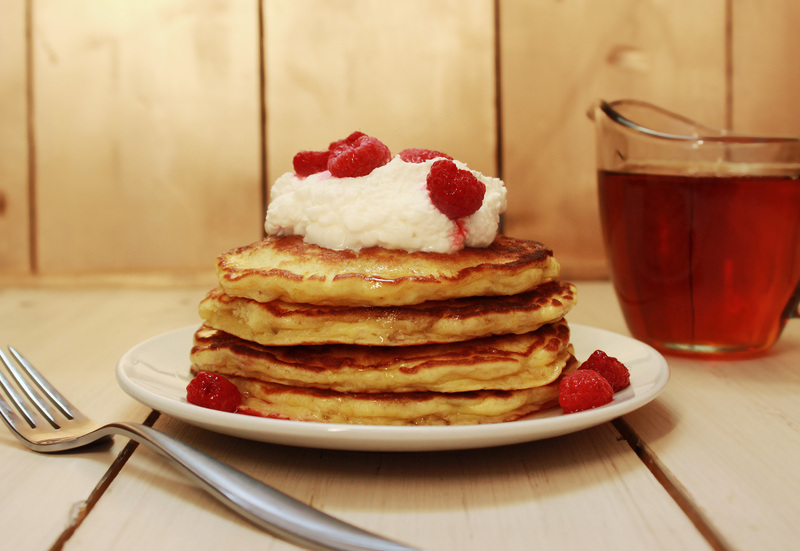 Serve with maple syrup, whipped cream and berries of your choice. By now these are the only pancakes I ever make. I don’t like a dry, fluffy, white pancake. These are moist and light. I use whole wheat flour in mine, and sucanat. Blueberries too!